Lower legs are sequin-spangled chiffon "fins"
Do your child's eyes light up when she spies anything "under the sea" related? Does she spend those summer days in the swimming pool pretending that she's a magical ocean maiden? When you go to the beach do you find she's squirreled away all sorts of beach debris from rocks and shells to sea glass? 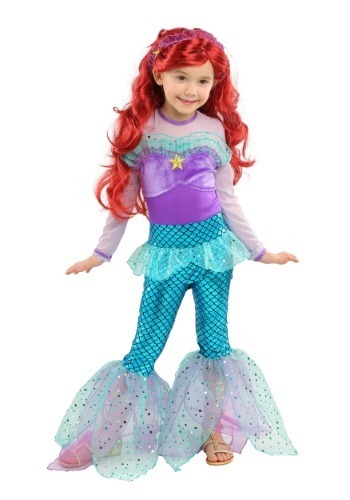 If so, you'll find you water enthusiast will love dressing up in this playful mermaid costume. If there was a disco in Atlantis this ensemble would be all the rage. The clams would stop and drop their shells when they saw the glamorous shiny pants. All the dolphins would want to take this funky merlady for a spin, because what's more fun than sparkle and flare? This daughter of Triton has got to shake her fins made of sparkly chiffon when the whales start singing their strange tunes. You'd better believe her moves even impress the seals who would spin around and jump to the surface, excited by this brand new fashion. Life is better under the sea. Who was that mermaid who said you can't dance without feet? Totally not true! Whether your merchild is starting a fashion revolution in the depths of the ocean or sunbathing on rocky coast, she'll be looking like an aquatic star in this purple and aqua jumpsuit. Now that she's a top-ranking mermaid maybe it won't be so hard to get her to take a bath. Either way, we're sure that this costume will go over swimmingly. Although this was super cute it was very short through the torso. My 4yo wore this and she isn’t very tall. Also the “fins” created a tripping hazard. Love that this was pants and not a skirt. My 4 year old loved it and it fit her well. She was very comfortable!